Neoclassical design is an interpretation, an homage if you like, of designs, structures, motifs and disciplines derived from Greek and Roman architecture and is the most important and enduring of the 18th century. The term is one of style and not necessarily indicative of a particular period although generally it is referred to as being late 18th to 19th century. Its origins can be traced back to the unveiling of Pompeii and the subsequent grand tours of the more affluent and adventurous academics of the time. This activity brought about a greater understanding and increased popularity of the classics in general and as such the term refers to all aspects of the arts, not just to architecture and furniture. 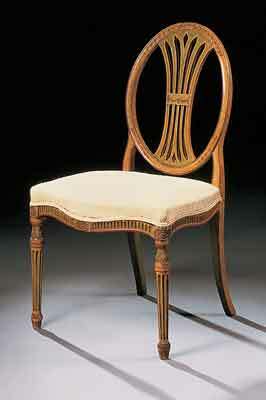 The finest exponent of this style was Robert Adam, 1728-92. Considered to be the greatest British architect of the late 18th century, he is equally respected as a furniture designer. A true master of his craft and a household name today, Adam was the conduit between the predominant influences of the time and a growing demand for association with a new academic mode of expression. His style was sophisticated, delicate and restrained by the standards of the day in contrast to the lavish excesses of the rococo period before. Thomas Hope on the other hand saw things differently and adopted a more literal style, giving way to more robustly constructed pieces influenced by his visits to Greece, Turkey and Egypt. 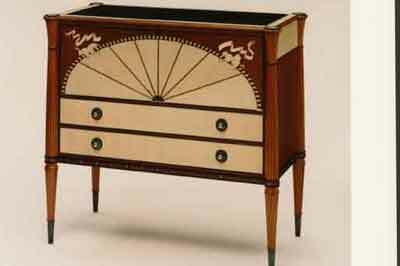 As a consequence of these grand tours there has been no clear boundary for the role played by architects and their influence on furniture design to this day. The movement towards this style was driven by a desire to achieve structural purity combining the elements of dignity and grandeur with academic artistry. Perhaps the best examples of this are to be seen in some of our most important public buildings. These monuments were symbols of the growing economic strength of Britain in the late 18th and 19th centuries and any implied link between the achievements of the ancient empires and those of modern-day Britain at that time was clearly intentional. St Georges Hall in Liverpool is considered to be the finest example of neoclassical architecture in Europe. When we talk about neoclassicism in furniture design it is with a mixture of academic study and artistic interpretation - think Brian Sewell rather than Grand Designs. Interiors and furniture were decorated with a diversity of detail including animal motifs such as rams heads and paws as well as floral ornamentation such as acanthus leaves. For composition many of the features were drawn directly from architectural principles with the same attention to detail being applied using the golden ratio and other mathematical tools. This design by numbers approach has a place in contemporary design whether applied to furniture, architecture or two-dimensional art even though we do not fully understand how it works. The golden rectangle is a useful tool for determining proportion and for the purpose of this exercise is best understood if we imagine a piece of furniture intended for use up against a wall viewed in front elevation. Using the ratio accurately allows you to give height to the object with appropriate and, more importantly, balanced width. Think of it as a starting point with a zero rating. Any deviation up, down or away from this setting will achieve a taller, wider, thinner structure than the one we perceive to be visually and proportionately correct. 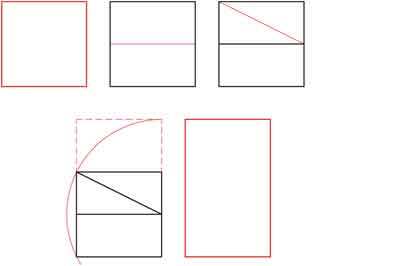 Objects contained within the golden rectangle are perceived as neither being too tall nor too wide. By creating additional golden rectangles within the first, a series of reference points becomes available either to follow or ignore in order to move away from the perfect composition. For examples of this in action have a look at this website. A second and less rigid method of determining proportion and balance is the golden ratio. In its simplest form it works by using the rule of thirds. Again working in front elevation, create a base line and in this case a ceiling. 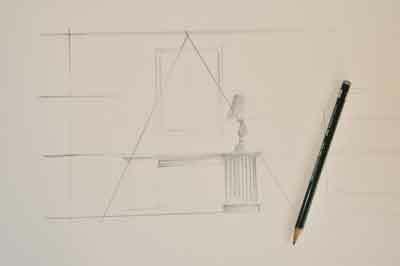 By dividing a vertical centreline into thirds reference points can be established to suggest a basic composition. Note that the free space above and below the mirror is approximately one-third of the space taken up on either side of the horizontal centre line for this object. Similarly the end units of the sideboard are approximately one-third of the width of the mirror. Additional elements can be added to the scheme in the same way using these proportions to a different scale. Staring at a blank piece of paper can be terribly frustrating if you cannot think exactly where to make your first mark, but if you start with either of these techniques you will be in extremely good company.